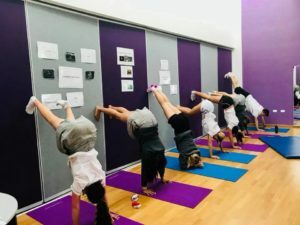 Yoga For Schools & Corporate - Deva Co.
Toddler yoga classes are usually repetitive as this the best way for children to learn. The focal point of the class is on the toddler in a safe environment. The class consists of animal asana (poses), singing to nursery rhymes and familiar songs, using our imagination and loads of playing! Parent participation required. 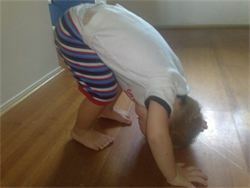 In this hour of fun the classes are based on kids yoga using positive themes, stories and imagination. The kids energy is upped and hopefully used up before the energy is brought down by ending the class with guided relaxation and meditation that is age appropriate. This hour of yoga for teens helps them expend energy and energise them in a positive way. It focuses on posture, strengthening the core, breath awareness all with a positive theme or affirmation. Their energy is brought down by ending the class with guided relaxation and meditation that is age appropriate. I Just wanted to thank you again on behalf of the PE Extension class here at Elanora for your instruction today. I have had good feedback from the students I have seen since this morning. They thoroughly enjoyed the session and I’m sure you have made a difference to how some of them approach physical activity in the future. Again, thanks for giving up your time and sharing your knowledge with so many students in one space. Many thanks once again for another great term of “Yoga for Clover”. Your wisdom and support for our students has been much appreciated by the children, their parents, and teachers too. I hope we continue to have your yoga classes here next year. 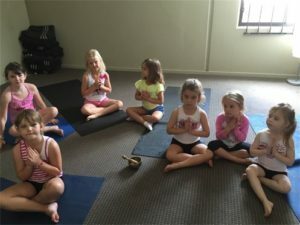 Mini Buddhas Yoga is an effective, age appropriate program that teaches children to manage their emotions and behaviour through yoga techniques.